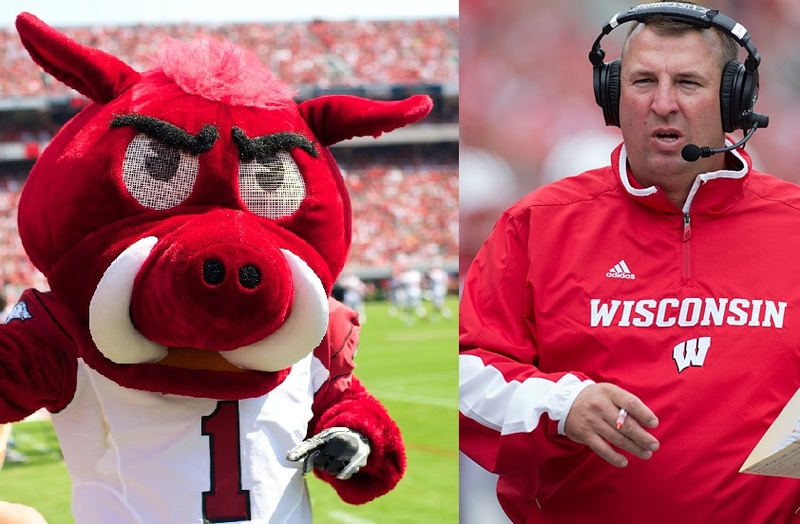 BIELEMA: "I'm looking forward to hogging timeouts as coach, shouting 'woo pig souey' as Tusk the mascot." FAYETTEVILLE, ARKANSAS - (@The Comedy News) - Wisconsin Football head coach Bret Bielema will be leaving Madison to do simultanious duty as the University of Arkansas Razorbacks' head coach and mascot, Tusk. "I'm looking forward to hogging timeouts as coach, and shouting 'woo pig souey' as mascot," announced Bielema this afternoon. Arkansas officials are confidant that Bielema has the ample mind and body to take on the challenging positions of both coach and mascot. As a replacement for Coach Bielema, the Wisconsin Badgers will be hiring former Green Bay Packer Brett Favre to be their head coach for 2013 Rose Bowl game against Stanford. UW officials are in talks to enroll Brett in grad school---- just in case the Badgers need him to play quarterback in the big game.